Licensed by GKids. Click on here to go buy movie. – Story insight: Momo Miyaura’s father had just passed away. 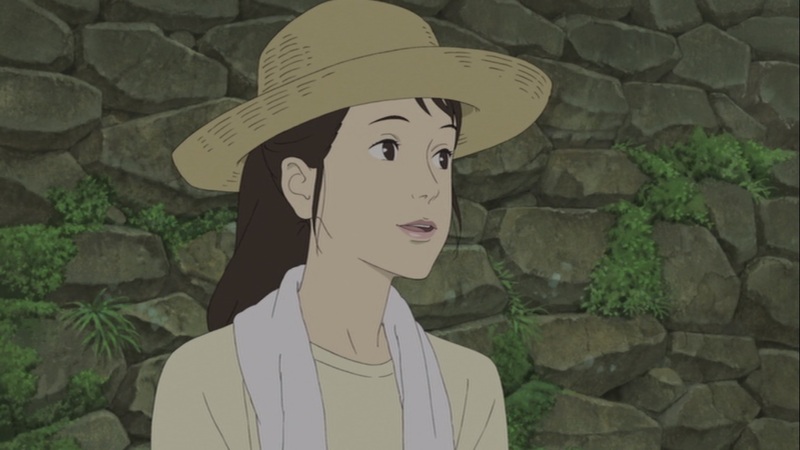 Due to her Daddy’s passing, Momo and her mother, Ikuko Miyaura, will travel from the big city of Tokyo to the rural island of Shio where her uncle and aunt live. During Ikuko’s childhood she lived on Shio for heath reasons. 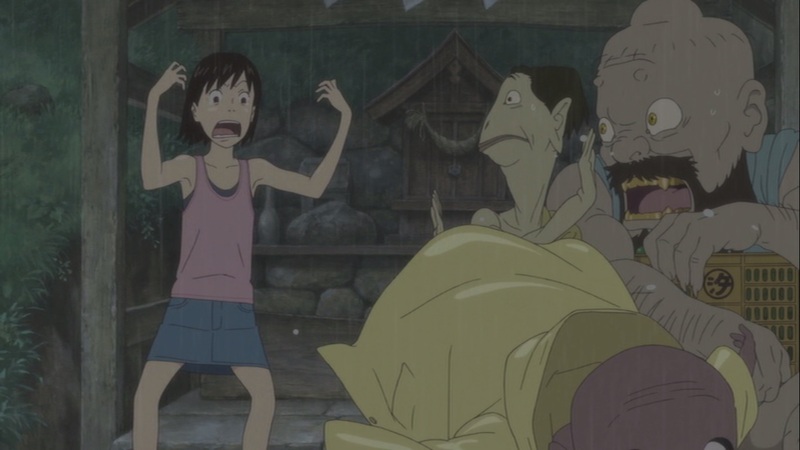 Before departing from the boat onto the island, three rain drops fall onto Momo’s head. What’s strange is they don’t lose their form and follow the mother and daughter. The mother isn’t pointed out to be her mother till over five minutes into the movie. Since Ikuko is now a widow, she will be working manual labor jobs to get by, going back to school to become a nurse, and she also has to deal with her asthma. 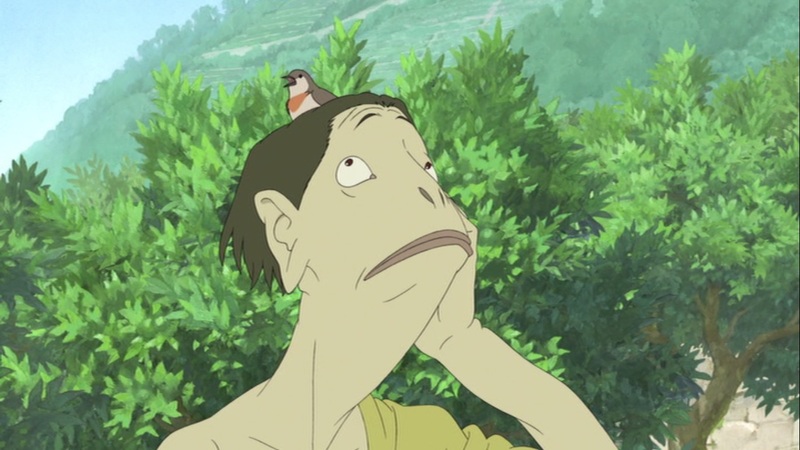 We are introduced to some quirky characters like Kouichi (Ikuko’s childhood friend and mail deliverer if he can get it right the first time) and Youta (Momo’s new friend in childhood, he reminds me of Joseph from King of the Hill) on this island, obviously. Momo’s main issue is before Kazou Miyaura (her father) died, the two got into a dispute. She bought her parents concert tickets in secrete. This concert is the same one where Kazou and Ikuko meet. Momo’s dad was going to research fish out at sea and he plays off the situation like it was nothing. During the trip he died. Momo and Mama are now in shambles as we see the two endure the funeral. After the funeral, we see Momo rummaging through Kazou’s work desk. 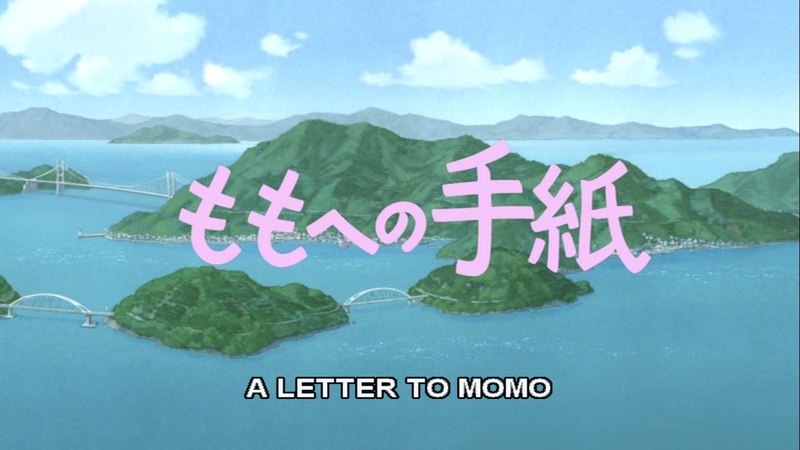 She discovers a letter that the departed didn’t finish with only two words written on the page, “To Momo”. Momo treasures this letter and wonders what he would of written while she remorses the “I hate you and hope you never come back” angst fuss towards him. 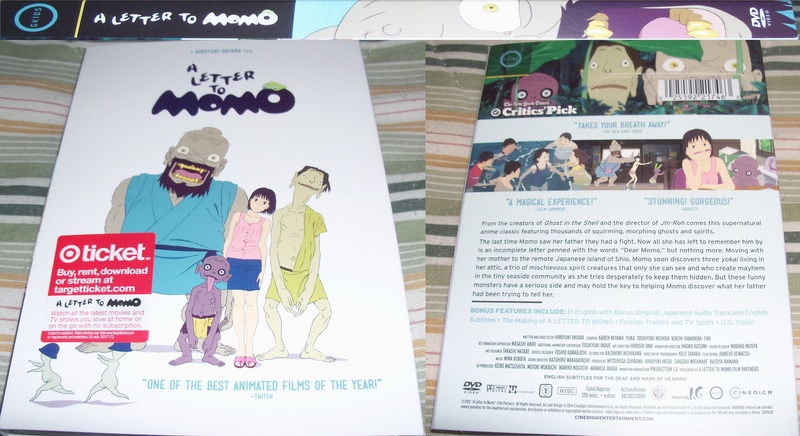 Around eight minutes into the movie, the Aunt takes Momo up to the attic. Here the eleven-year-old opens a fancy box and finds an ancient book of Japanese prints of Yokai folklore. The movie in the English dub never says “Yokai”, but use ogre, imp, and demon in various ways instead of just saying “Yokai.” Technically it’s not wrong due to the tonality of the word, but some culture is lost. The Aunt tells Momo that her late great grandfather used to collect these prints and could communicate with the Yokai. When they leave, the three rain droplets from before discover the unsealed black box and seeps through the sides. 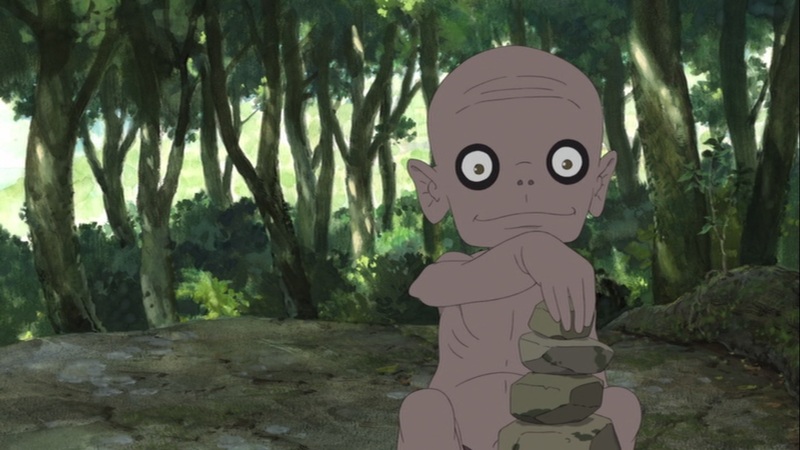 The two days (or twenty-eight minutes into the movie), after Momo’s imagination scars her into the mountains like a crazy person after these two days, Momo sits at an offering shrine as it begins to rain. Here she can finally meet the town’s robbers who are Yokai. These three Yokai are named Iwa, Kawa, and Mame. Now seeing each other the four start to scream at each other. 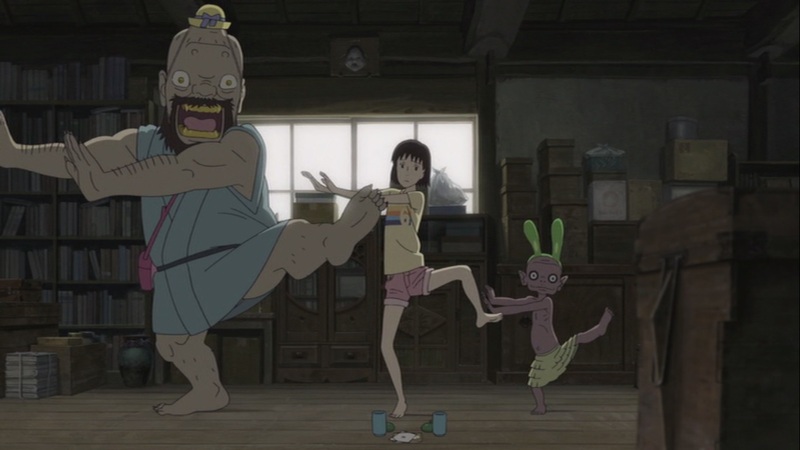 With Yokai driving Momo mad, her being a horrible girlfriend with daddy issues, and grieving alone over her father’s death how will the daring eleven-year-old managed her situation? Also did she ever finish her homework? Note: Only covering the main characters. Personality: Thoughtful, scaredy cat, imaginative, and depressed. 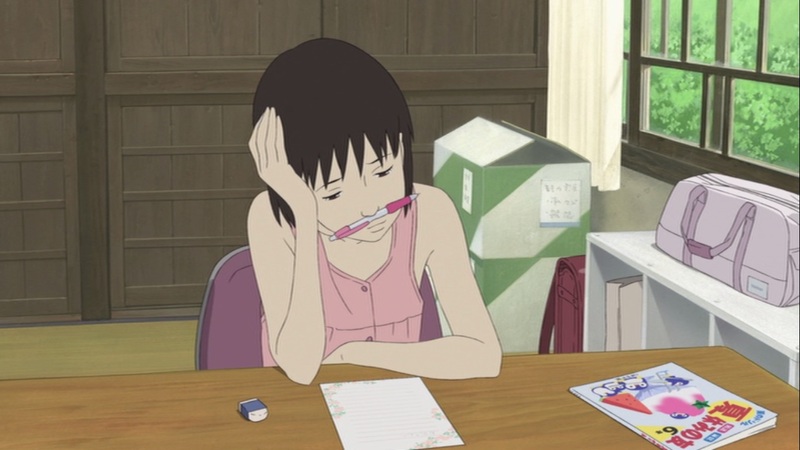 Role: Main Character, terrible girl friend, and interacts with Yokai as she tries to figure out what her father wrote to her. Role: Sub main character, who has asthma and pushes herself for the better benefit of her daughter’s welfare even if the stress subtly changes her. Why this animation is as crisp as about FOURTEEN DIFFERENT PRODUCTION STUDIOS, some studios maybe subsets of each other but it’s the different names I’m counting not the families, WORKING ON IT SHOULD DELIVER(!!! ), which it dose. Even the blind can tell you that the animation is the most amazing part of this movie’s experience. The rotoscope is smooth and not jarring to look at. The CG exists but blends well with the scenes. I am looking at a different culture and people come to life in front of me. The scenery reminds me of the city in Shenmue or the cities in Katamari Demacy. Animation Rating: 4/5 (B) SPARKING!!! The sounds make the scenes come to life. The music is there to harmonize the tone. The majority of the music in this film is orchestrated. The music reminds me of the Doggie Poo movie. Sound Rating: 3.5/5 (B) Hmm, I say. Would you care for some Gray Poupon? This first premiered at T.I.F.F. in 2012 and this defiantly is a film festival winner, but may not translate well with the average viewer. The fourteen different productions behind this film and a two hour run-time kind of make this film seem like a lengthy tech demo into the Canadian market which this did win a lot of awards. That’s nice but winning a trophy doesn’t mean that it’s the best of all time. The problem I have with the movie is being two hours long. The length should have more happening during this run-time. If it’s run-time was fourty-five or an hour fifteen minutes long, it would have been forgivable. At the movie doesn’t suffer through the same synthoms as anime movies from the 1970’s or 1980’s with their long stretch in of run-time during the middle the movie. I stress this because Momo and the Yokai should have had more mischief/misadventures happen given their situation. Because this wasn’t explored more it gets the movie a lackluster vibe. The]is vibe might have been the result of Hiroyuki Okiura taking on too many hats to complete his vision and the seven year production to finish the film. Darn it Momo!!! You left your body lying around the house. How did I feel about the story and characters? Well, I did find it light hearted and enjoyable at times. 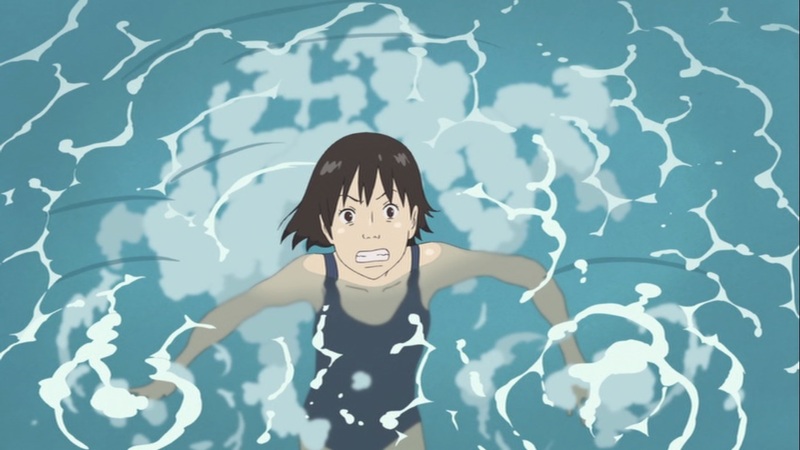 It almost, at the beginning, had similar undertones that director Mamoru Hosoda is known for but I am glad that it didn’t infect the film. 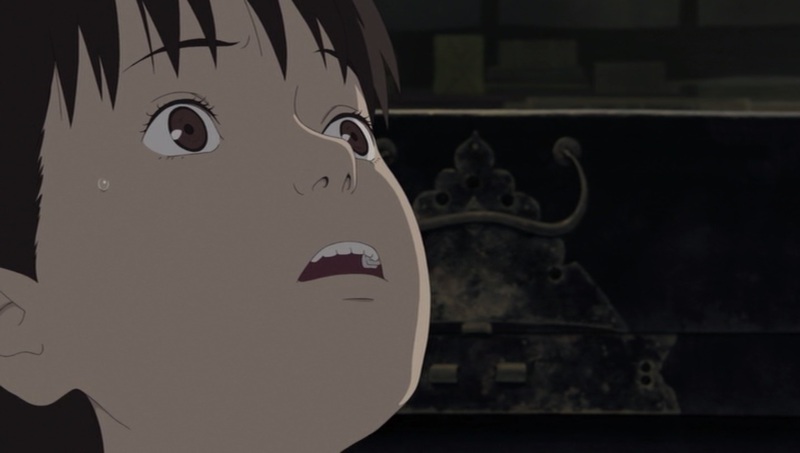 Just like Momo: The Girl God of Death, the movie did a great job of addressing the issues of someone’s death and how it would affect others. All of the details that were given and are used throughout the film leaving but only one question unanswered. Did Momo finish her homework? Momo as a character behaves just like any eleven-year-old girl would, but at certain times her and other character’s actions would be what the writer would want, but not what the character would do in the situation. Like Momo’s mom not dragging her away because she said so, but letting her reveal a plot point. Also to point out, Momo in one scene is not fusing at her mom for trying to find a playmate for her in public on the island. I agree that with her being bummed out that she would be unsociable, but a mother/daughter fight is an instantaneous event. 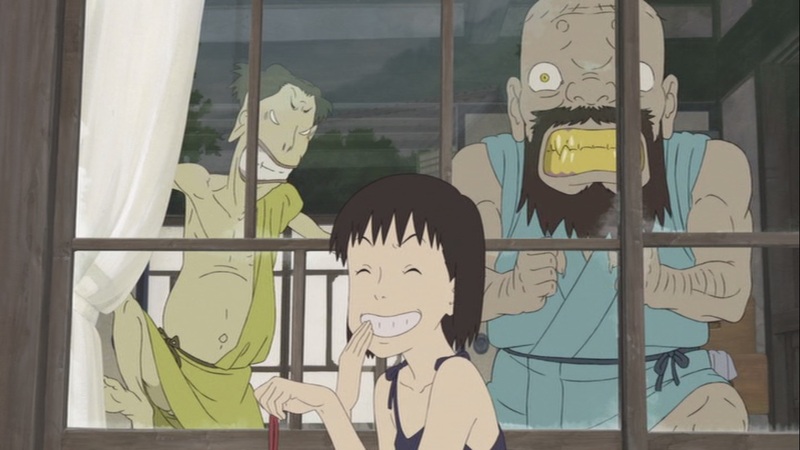 The Yokai do make this film fun. With their outrageous personalities and mission these silly creatures are fun to watch. They act one sided, but that’s what they are. Would I recommend a watch? 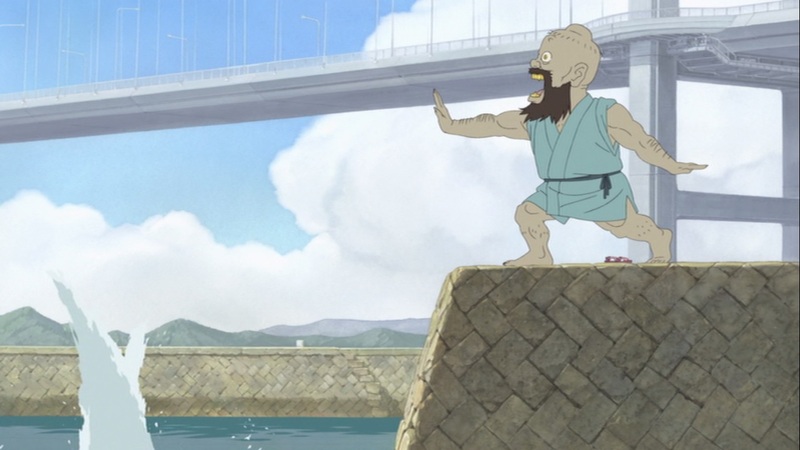 Yeah, I will say that the film is mediocre as a majority just due to an extra hour added to the film, but with the animation and light heartedness of the film I’ll still stand by to say go watch it; however, Momo: The Girl God of Death would be a better investment of your time. It’s like Thriller fused with the Time Warp. Plot: 3.75/5 (B) Like puzzle pieces every detail was used only leaving one question unanswered. Performance: 3.5/5 (B) Debbie has a downer and it ain’t no crime. Pace: 2/5 (D) Needs more substance to justify length. Characters: 3.5/5 (B) I grew to like them. 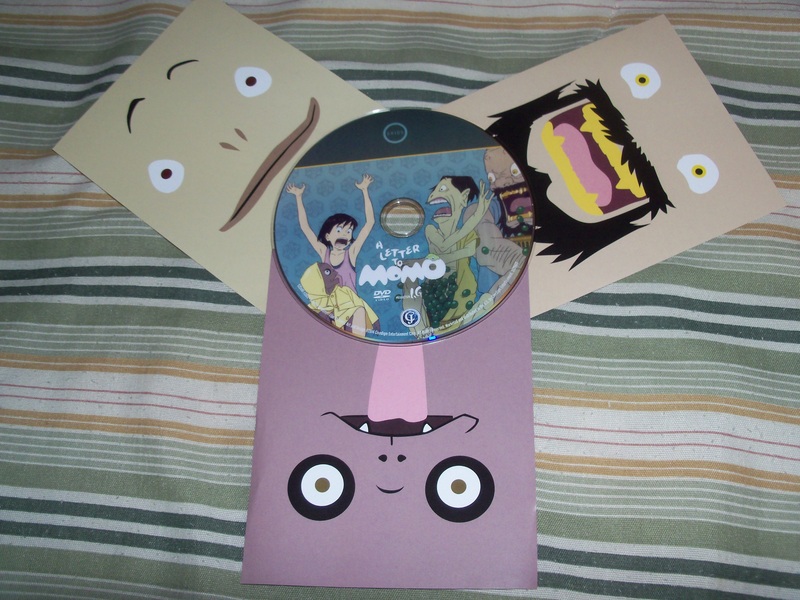 Production Quality: 3.75/5 (B) Animation: Amazing. Sound: Regal. Pro’s, Con’s, and other thoughts: 3/5 (C) Give it a watch anyway. Overall total: 3.25/5 (C) I want to like this film more, but the extra time begs for more substance even if it’s towards children. Dose contains thefts and a fart. This entry was posted in New Anime Brew and tagged A Letter to Momo, anime, Bandai Visual, CBC, comedy, comedy anime, Drama, Drama anime, Hiroyuki Okiura, HoriPro, Ikuko Miyaura, Iwa, JR Kikaku, Kadokawa Pictures, Kadokawa Shoten, Kawa, Kazou Miyaura, Kazuhiro Wakabayashi, Kouichi, Ltd., Main Character, Mainichi Broadcasting System, Mame, Mina Kubota, Momo, Momo anime, Momo Miyaura, New Anime Brew, OAV, Oriental Light and Magic, Production I.G., RCC Chugoku Broadcasting, Shio, Supernatural, Supernatural Anime, TBS, The Mainichi Newspapers, The Wolf Brigade, Tokyu Recreation Co., Toshiyuki Nishida, Yahoo! Japan, Youta.